Continual improvement is a commonly used term in business today, but what does it actually mean? This piece will define the term continual improvement, explain why continual improvement is important and list the three main continual improvement models. At it's simplest, continual improvement can be defined as continuously trying to improve a business. While this is technically correct, it does not capture the subtlety of the term in the modern business context. To define continual improvement, as it is most often used, it is necessary to adopt a more specific definition of continual improvement. Ultimately to be successful continual improvement must be applied to a process. Without an understanding of the inputs and outputs to a company, it is not possible to know if changes are having a positive impact or not. Every activity in a company can be modelled as a process, some processes are self-evident like a production line, but even less concrete ideas like culture can be viewed as a process. In the context of an enterprise, the definition of continual improvement is; to continuously improve the processes in terms of the most important outputs. Why Is Continual Improvement Important? As economies are now globally competitive, simply maintaining current levels of performance is not an option, even treading water an enterprise will lose ground to its competition. To remaining competitive, a business must continuously improve its processes. Quality and continual improvement are normally considered synonymous, but business disciplines other than quality can – and should – be continually improved. Continual improvement is also a key way to engage employees with the business. It allows them to have input into processes and add more value by removing the annoyances that prevent them from doing their jobs. Continual improvement can be even be used in disciplines that are not obviously linked to the customer, for example; health and safety, human resource management and research & development. All areas of an enterprise should be targeted to reduce costs, increase efficiency and improve quality. What Are The Main Continual Improvement Models? It is possible to make changes on an ad hoc basis or even create a new continual improvement model, however there are already proven models used by some of the most successful multi-national enterprises. The models consist of a number of continual improvement tools and a process or ‘continual improvement cycle’ to provide organisation for improvements. Six Sigma uses the DMAI²C (Define, Measure, Analyse, Innovate & Improve, Control) cycle to provide organisation to improvements. The focus of Six Sigma is to reduce defects (errors) by minimising process variation. Six Sigma collects a variety of pre-existing quality management and statistical tools into a structured system. TPS uses the PDCA (Plan, Do, Check, Act) cycle to manage improvements. Lean continual improvement focuses on reducing waste and making the process ‘flow’. The term ‘Lean Manufacturing’ was coined by western academics studying the Toyota Production System. Theory Of Constraints uses the following cycle: Identify the constraint, exploit the constraint, subordinate other processes to the constraint, elevate the constraint, then repeat the process if the constraint has moved. Key to understanding Theory Of Constraints is that in any process there is one ‘constraint’; a step that limits the overall throughput of the process. By improving flow through the constraint, the overall system can be improved. 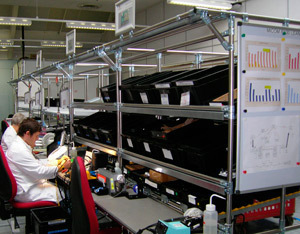 Each model has a different focus, cycle and tools, however continual improvement techniques are frequently borrowed from different models as necessary. The most often used combination is 'Lean Six Sigma', which mixes the structure and rigour from Six Sigma with some of the more practical continual improvement tools from Lean. Many businesses choose to implement one of the standard models as a formal continual improvement programme. However regardless of the continual improvement strategies employed, the most important thing is to instil a culture of continually trying to improve business processes. So what is continual improvement? Continual improvement is one of the best ways to keep an enterprise competitive, now and in the future.